Nebraska Prairie-Chicken Festival - Calamus Outfitters hosts the Nebraska Prairie-Chicken Festival each April. This fun weekend festival aims to celebrate prairie grouse species, the grasslands they inhabit and the culture that surrounds them. Loup County/Taylor Area - Loup County is an excellent first step in the exploration of the Sandhills of Nebraska. As one of the last vestiges of the great American plains it's hard not to be awestruck by the sheer magnitude of the Sandhills and its unspoiled natural condition. 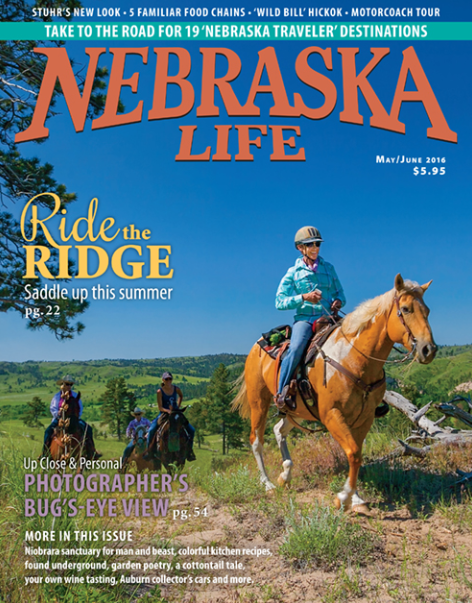 Nebraska Life Magazine - The magazine that explores Nebraska! We've been on the hunt for Doc Middleton, traveled on a cattle drive and hunted fossils with Mike Voorhies. We've caught a glimpse of ghosts in Grand Island, climbed to Nebraska's highest peaks and experienced game day in downtown Lincoln. Nebraska Game & Parks Commission - The Nebraska Game & Parks Commission is the place to gather all hunting and fishing rules and regulations for the state of Nebraska. "It doesn’t matter whether you are a billionaire executive; a country music producer or an average hard working Joe; Ron and Dodie won’t treat you any different and always make sure you have a good time. Ron was always more than happy to show you his brew system and how to make a good beer. Many would stop by not just to try the beer but to get tips from Ron on how to create their own. Because of this, in 2001 Ron decided to start his own brew club called Bootleg Brewers." "Taylor "Villagers" are life size paintings which "Capture The Spirit Of Our Past". The first Villager appeared in 2003, and now in 2015 there are 100 throughout the community of Taylor and Loup County. Every year six more Taylor "Villagers" are handmade and painted in Taylor by the Sandoz family and added to the growing list. With the Taylor "Villagers" brochure and location insert you can find the Taylor "Villagers". Enjoy searching for some of Taylor's Timeless Treasures!​"